I forget sometimes that we don't live an ordinary, suburban lifestyle. Having lived off the grid for over ten years, I don't always remember that our normal isn't everyones normal. When we moved into our shouse with no electricity, running water or flushing toilets, Maid Elizabeth was 11 years old. Master Hand Grenade was 4 and Miss Calamity 1. Princess Dragon Snack and Master Calvin were nothing more than longed for dreams. There was a distinct period of adjustment for this formerly suburban family, but we dug in and made the best of our chosen situation. The first winter in our Shouse was wonderfully quiet. With no electric refrigerator humming, no radios or televisions providing background noise and no computer demanding attention, our evenings were filled with family dinners, reading books aloud (by lamp light) snuggling under heavy blankets and sipping hot cocoa. Truthfully, once we got past the withdrawals from the modern world, we were content, peaceful and productive. Of all the children, only Maid Elizabeth remembered another life, but being 11, she viewed our new life as one huge adventure. Master Hand Grenade and Miss Calamity grew up with the soothing hiss of the Coleman lanterns, thinking everyone lived this way. They realized very early that they were never to leave the water running, because we would run out and have to start the generator. They learned to wash their faces, hands and feet before they went to bed so they didn't get their sheets dirty. Maid Elizabeth became my right hand, facing ferocious weather while digging a milk cow out of a mud hole, braving sub-zero temperatures to help me jump-start a fussy diesel generator and baking cookies, pies, cakes and everything else you can imagine in a wood cookstove to serve to our continual stream of guests. 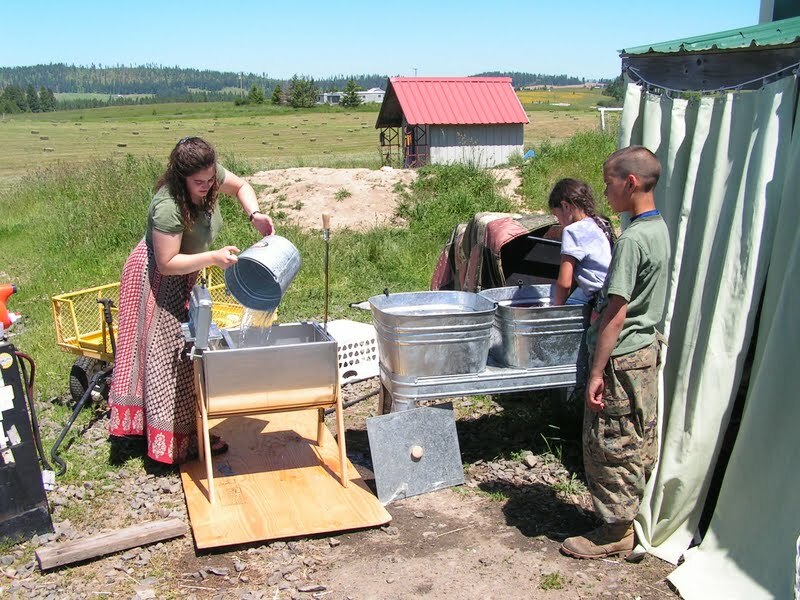 Eleven years later, we are still off-grid, however our circumstances are much changed. No longer do we enjoy the soothing sound of Coleman lanterns, but our shouse is lit by efficient compact fluorescent light bulbs. Our silent propane refrigerator has been replaced by a noisy electric model. Ipods, television and computers have invaded our once quiet household. From time to time, I actually forget that we are not "normal". Solar panels, a reliable generator and a huge battery bank lull me into a false sense of normalcy....and then, my kids go a-visting. While spending the night with our very dear friends, Princess Dragon Snack and Miss Calamity were preparing to take a bath. After the water had been turned on, allowing the tub to fill, Princess Dragon Snack turned to the friend they were staying with and asked, "why isn't your generator on? How do you get water?". At this point, Miss Calamity and her friend tried to explain that they had power so they didn't need a generator. Still not quite understanding, Princess Dragon Snack pressed on. "Yes, but where does your water come from?". Again, the girls tried to explain. They told her about power poles and how that brings power to a persons home and how that power runs the pump that brings in the water. Although she didn't fully understand, Princess Dragon Snack accepted their answer, took her bath and wondered at the miracle of power lines. The next day, I picked Miss Calamity and Princess Dragon Snack up at our friends house, and the first thing Princess Dragon Snack said was "Mom - did you know they don't have a generator?! They get their water from the power-light poles!". It was an amazing concept to our off-grid kid. For weeks after, every time we went to town Princess Dragon Snack would say "Look - they have power-light poles! They don't have a generator!". What our children consider normal is very different from what the rest of the world would consider normal. Our three year old knows when the choke needs to be adjusted on the generator and how to turn it off "all by his lonesome". Our six year old wonders where everybody else's solar panels are. Our 12 year old climbs on the roof to wipe snow off the panels in the winter. Our 15 year old knows how to change the oil, service and maintain about three different types of generators. Our 22 year old could run an entire household with nothing more than a wood cookstove, some stored foods and a Coleman lantern. These are not your typical, suburban kids. These are true, died-in-the-wool off-grid kids. You are doing a wonderful job for your family. Your kids have the best of all worlds - they can prosper in hard times and they can adapt to the "city" life if they have to. I have seen it many times a country boy (or girl) in the city is more at home than a city kid in the country (not all snakes crawl on the ground but watching for them is the same). It's very nice to see that todays kids can't get past or live without all the technology out there. I think you have a family to be proud of! I was listening to a sermon today about impacting lives. The preacher spoke of living a Christ-like life so that others might see. He also talked about the people who would criticize such a life. He described those people as being insecure, fearful they could not do the same, and therefore critical and hateful. What you are doing, the life you are leading, is impacting others. Not everyone is meant to live off-grid, but everyone should be prepared. You set a fine example as such and are a testament to your faith in Christ Jesus. It's not always the easiest path, but it's the right one. We don't live off-grid, I wish we did. Maybe one day. But country raised kids are different than city raised. Our daughter 8 yr old and special needs. She knows more about being prepared and where food comes from. She watches her kittens and smiles when they are practicing their battle skills (playing). She wants a pig so she can smoke ham and have bacon when she wants it. She helps her dad plant the garden. She waters and feeds her animals with minimum supervision. She is learning about archery and firearms, all well supervised and adjusted to her ability. Country kids are so much better off than city kids. Keep up the GREAT work with your off-grid family. You have taught me so much in the months I have been reading your blog. You let me know that my way of thinking isn't odd, it is practical. We have happy, healthy children learning to take care of themselves and others. PS: I have a college degree and my spelling is horrible. I love spell check. I am much better with numbers. Tell Maid Elizabeth that there are more important things in life that spelling!! What a blessing that your children are not encumbered with all the "things" the world deems important. But they know what is truly important in life...serving God and loving family. We don't need all the other stuff to live, some are nice and even convenient, but your family and others like yours have proven that you can be entirely content to live a simple life. I cannot wait until we are in a similar situation to yours. Thank you once again for sharing your family with us. It is a true joy to walk a little with you all. My mother was a wise woman. She taught us that into every person's life will come times of bounty and times of famine. And that the true test of a person was how s/he faired in both times. If you can enjoy the bounty without gloating, you were doing well. If you can get through the famine without blaming others, you were doing well. Seems to me, Enola, you and your family would get an A+ from my mom. You and your family have positively impacted my life in ways you will never know. THANK YOU! Enola, While we don't live as independently as your family, we still have raised our kids in the country. There is an ENORMOUS difference between city kids and country kids. Even though yours may have developed more sustaining skills, ours have raised chickens, pigs and lambs. They have helped learn how to garden, cook, and can up food. My weakness is sewing, so I must say they know how to hem and sew on a button, and do simple overcasting, but I can sew on my machine if I need to. They are respectful of others and helpful even when not needed. Keep up the wonderful work in your family, and with regards to your previous post, please don't let them bring you down. They know not what they are speaking about. What a blessing that your children are learning the essentials of self sufficiency by living them. Each one of them will become adults that will be able to thrive and not just survive. That's what I call success in parenting! i can remember when my family did not have a phone, a tv, and indoor plumbing...and i think every day that i could go back to that way of life very easily. my own son did not live that way, but he did spend most of his youth traveling with me and his dad while we were active duty military. it was quite a culture shock for him when we returned to life in the usa (he was ten yrs. old) and all his time had been spent in the far east or on isolated military bases. the way the economy is going these days i suspect that many young people are in for their own form of culture shock...it is a very good thing that our children know how to do things for themselves. Just caught up on all the fluff and nonsense-very small minds can't see past the noses on their faces! I think they have missed the point completely. The word prepare is simple enough to understand; it is doing those things to be prepared that takes time and effort. You either are or you aren't. And to what degree someone prepares is up to them-other people should mind their own business (oh, that is the rub, isn't it?)! Calamities happen and often they are completely unexpected. I for one, have learned quite a lot from how you and your family have chosen to live and find it remarkedly similar to our ancestors-who, by the way, if they had not done exactly the same things -we would most likely not be here! One more thing, it is amazing to me that in today's world where everything is so easily obtainable and taken for granted, people choose to pay large sums of money to immerse themselves(for a week)"living off grid" or farming or raching,etc., and call it vacation! Perhaps you should set up a yurt or two on your property and open up a "homesteading family get-a-way" where your "guests" do the chores and beg to learn the art of bread-making! If you can stand one more spelling comment-my daughter worked as an editor for a college professor(today,a very renowned author) who could not spell,mixed up parts of speech and never, ever used a comma! A great many adults have no idea where the electrons or water comes from-or how to check the oil in their car,much less change it(what I call Turnkey People)-you-and your children-are blessed. Knowing How is much better than Having Stuff. Loved this post. Like most other commentators, we lead a very different life in suburbia. But reading your blog and Patrice's blog over the past year or so has made a dramatic difference in not just MY life, but also the in the lives of my three children. What types of differences? Well, even here in the suburbs, my kids helped raise chicks last year and they now know how to feed chickens, collect eggs, and muck out our coop/run. They have no cable TV anymore, although we do receive over-the-air HDTV (much of it here in SE Virginia is religious programming, but the TV is barely on for an hour or so per WEEK). They know how to mix chicken poop-enriched compost into the garden dirt and use it to grow vegetables. They also helped construct the first set of rain barrels we use for watering the garden. And they LOVE my homemade bread, made of course from freshly-ground wheat... they wolf it down like it's candy. Getting the picture? Seeing your family living as you do, it makes it much easier for me to take each "baby" step in the same direction with my own family. So your posts are like a light held high above the yuck of "modern" life, showing the way to a BETTER (not easier) way of living. And there are probably a lot of folks like me that read your writing frequently but just don't provide comments and feedback very often. So take heart that you're impacting more people's lives than you could possibly imagine. :) Our power comes from solar panels and batteries - my 7 year old is concerned, when we're out, that "if they don't turn things off, their batteries will deplete" and one day he said, "You know, in ALL of my friends' houses, their toilets flush with a little switch and water goes in." It's like he was sharing the amazing secret of flush toilets with me. And other people put leftover food *in the garbage can*, if you can imagine, instead of feeding it to the dog or chickens, and some mommies go to the *hospital* to have babies (instead of sending the children outside to play). LOL I have weird children.